Goddess Saraswathi is the consort of Lord Brahma and is the Goddess of wisdom and learning. Goddess Saraswati is considered as the personification of all knowledge. Her presence is elegant and she is depicted as wearing a pure white sari and seated on a white lotus representing purity and brilliance. Goddess Saraswati carries a Veena which represents mastery over the physical organs and actions where the veena is symbolic of life and strings are symbolic of feelings. The Book she carries is symbolic of Knowledge. The white swan, lotus, cloths and white ornaments are symbolic of her chastity and purity. Goddess Saraswati is said to possess the powers of speech, wisdom and learning. Saraswati Mantra is an important mantra and people pray to her for guidance and knowledge. 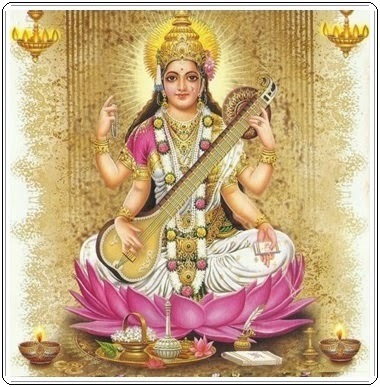 "May Goddess Saraswati, who is fair and beautiful like the jasmine-colored moon and whose pure white garland resembles frosty dew drops; who is adorned in radiant white attire, on whose arm rests the veena, and whose throne is a white lotus; who is surrounded and respected by the Gods, Protect me. May you remove my lethargy and brighten my life with the light of knowledge."